Photo: Wood engraving by Abel Bowen of Boston, ca. 1828, of the first church building, 1734-1828, built by John 'Indicott'. "In 1625 the Reverend William Blaxton, an Anglican clergyman, arrived in what was later named Boston and settled on the slope of a hill (now Beacon Hill). He lived there as the lone white man until 1630, when Puritans of the Massachusetts Bay Company arrived to colonize the area. The Puritans firmly established their church to be supported by all citizens and Blaxton departed for Rhode Island, where he hoped for more tolerance. Ironically, over fifty years passed before the church which Blaxton represented became a part of the religious life of the town. These obstinate, zealous Puritans resisted any English attempt to impose Anglicanism, which certainly between 1649 and 1660 the Commonwealth had no interest in doing. Finally in 1686, King William sent, along with his new representative, Joseph Dudley, the Reverend Robert Ratcliffe, whose mission was to establish an Anglican parish in Boston. Dudley's successor, Sir Edmund Andros, appropriated the Old South Church (Congregational) for services at certain times until King's Chapel was finished in 1688. A second Episcopal church, Christ Church (the "Old North" Church), was built in 1723, but in a few years' time these parishes had grown to such an extent that the need was felt for yet another. A wealthy Anglican, Leonard Vassall, bought some land in 1728 which he conveyed in 1730 to a committee which was to erect a church on the site within five years and five months). Subscriptions were raised for the embryonic church, and an attempt was made to secure additional funds from the Society for the Propagation of the Gospel in Foreign Parts, a missionary group in London which helped finance new churches. The Reverend Roger (Mr. Commissary) Price, the representative of the Bishop of London in Boston, disapproved of the new project; therefore no money was forthcoming from that source. (This proved a blessing of sorts, for from the beginning Trinity had to take responsibility for raising and disbursing its own money.) Nonetheless, there was sufficient conviction of the project's worthiness that on October 1733, fourteen men met in Luke Verdy's tavern, the Royal Exchange, to elect four of their number - "Peter Luce, Merchant; Thomas Child, Distiller; William Price, Cabinet Maker; Thomas Greene, Merchant" - to the Building Committee for the newly constituted church. And on November 12, 1733, the church records report that it was "Voted, that we pay Mr. John Indicott Twenty one Hundred Pounds for Building the Church and finding the Stuff & Excepting the Raising Dinner which he is not to find. On April 10, 1734, it was "Voted, that the following words be writ on the Stone (Trinity Church this Corner stone was laid by the Rev'd Mr. Commissary Price 15th April 1734.)" 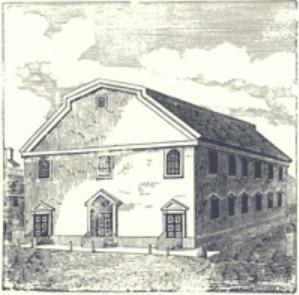 A year later, in the summer, the building was nearing readiness and "Mr. Commissary Price appointed Fryday the 15th August 1735 to be the day when he would Preach the first Sermon in Trinity Church." From "History of the Parish, 1728-1978" Trinity Church: The Story of an Episcopal Parish in the City of Boston, The Wardens & Vestry of Trinity Church in the City of Boston, 1978, Bettina Norton, ed. Each condition analysis is unique because the windows in the building are unique. While there are many characteristics that all stained glass windows share, each occupies a particular location in a building, is subject to different weathering effects, structural stresses, and repair history. Using the analysis of one window to restore another would be as ineffectual and inappropriate as using the medical history of one individual to treat another. Each window must be examined within its own context and any treatment determined from the results. Any report begins with an overview of the background and history of the windows being treated. 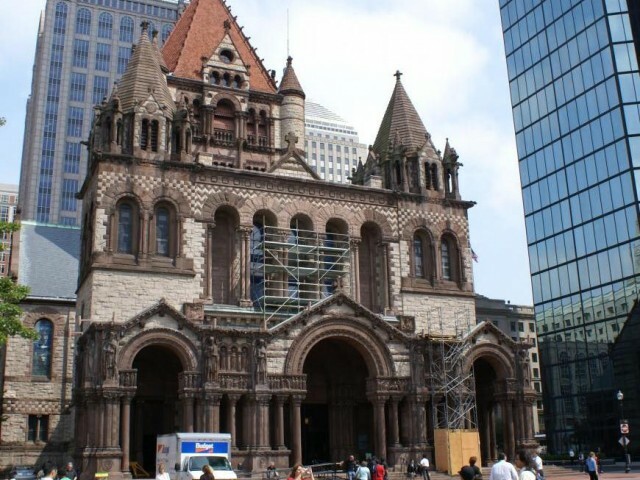 The following example is from Trinity Church, Boston. ... A condition analysis does not make recommendations based on artistic significance, but perceived artistic merit may ultimately influence decisions made for their restoration. Before embarking on the window-by-window condition analysis, which will discuss the individual artists and commissions briefly, we feel it is important to place the windows on a level artistic playing ground by explaining their significance contextually rather than individually. 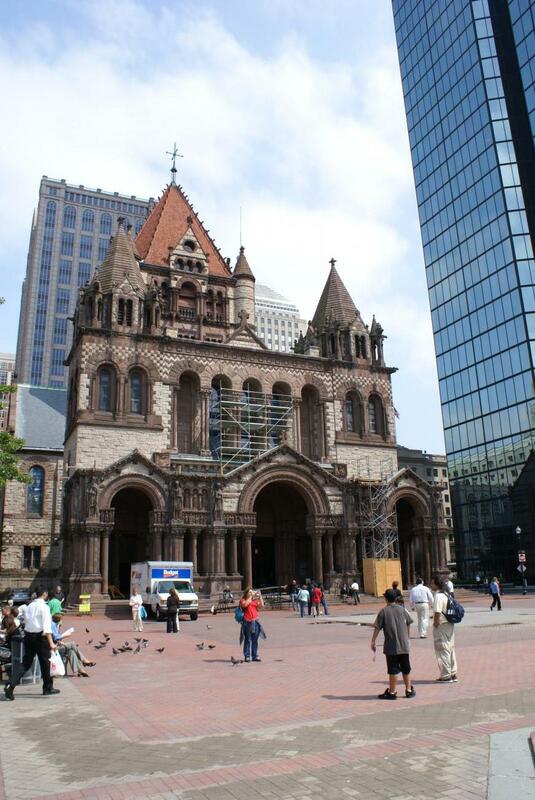 "The order of installation of the windows in Trinity Church by the Building Committee with the constant aid of [Rev. Phillips] Brooks suggests that they, like La Farge, learned from their efforts. The fact that all but one of the large windows installed in the church after 1880 were executed by La Farge ... is certainly testimony to the regard in which his work was held. Our late twentieth-century perspective has placed La Farge and his developments in window design far above English and French artists of the same period. While this point of view is arguable from an art historical standpoint, in terms of the care and restoration of the windows of Trinity Church it is important to view the windows in the context of their time period and with sensitivity towards the aesthetic values of that period. It is critical as well to understand what motivated the selection of certain artists and iconography; influences range from personal preferences to market availability. The construction of Trinity Church in early 1877, at which time the Building Committee, or at least Rev. Brooks, had begun the search for appropriate memorial stained glass windows. Only one window, "The Baptism," Window 11, by the London firm of Clayton & Bell was installed at the time of consecration in February, 1877, but Brooks commissioned two more chancel windows immediately, and the remaining four chancel windows by the summer of the same year. The eighth Clayton & Bell window, "David Removing the Ark," Window 2, was also commissioned around this time and installed by 1878. Similarly, the windows by Burlison and Grylls of London beneath the North Transept balcony (Windows 27-30) and in the Robing Room (Window 19), Daniel Cottier & Co. of London and New York beneath the South Transept balcony (Windows 22-25), Henry Holiday of London in the west wall of the Nave, and A. Oudinot of Paris in the South Transept balcony were all commissioned in 1877-78. The two William Morris-Edward Burne-Jones windows (Window 14 in the North Transept and Window 26, "David's Charge to Solomon" in the Baptistry) were commissioned and installed in 1880 and 1882, and the third Holiday window, "The Transfiguration," Window 4, in 1885. In total, twenty of the thirty-three windows were commissioned within a year of the church's completion, 1878, and another three were completed by 1885, filling seventy percent of the window openings. 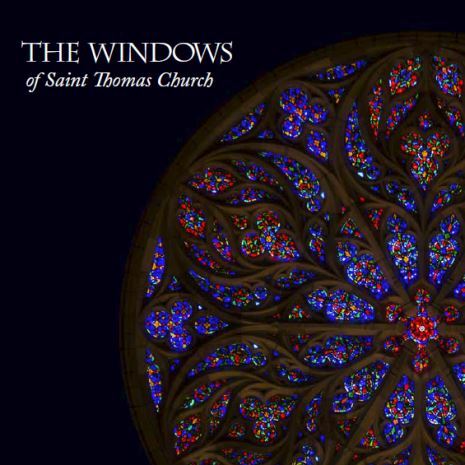 John La Farge received five window commissions from the Building Committee. The first, "Christ Blessing" or "Christ in Majesty" (Window 1), was installed in 1883; the second, "IEPOSOLYMA" or "The New Jerusalem" (Window 16), in 1884; the third, "Purity," in the Parish House in 1885; the fourth, "Presentation of Mary at the Temple" (Window 3), in 1888; and the last, "The Resurrection" (Window 15), fourteen years later, in 1902. The remaining windows were all installed in the twentieth century, in the 1920s: "St. Luke the Evangelist" (Window 5), by Heaton, Butler & Bayne of London, around 1920; and "Apostles," "Evangelists," and the "Solomon" window (Windows 20, 21, 31, 32, and 33) by Margaret Redmond of Boston in 1927. It might be tempting to assume, as Norton, et al., imply, that since the mural decoration of the church had been entrusted to La Farge in 1876, had the Building Committee known better they would have commissioned La Farge to provide more windows than just the four in the church. Even the curmudgeonly Hitchcock admits that "the La Farge windows in the facade are magnificent in colour and scale .... They imitate no earlier glass, and yet rival the best of the past in their quality of low burning intensity ... the feat of modelling plausibly in painted glass is surprisingly successful." Although he also calls the design "derivative," the impression the reader is left with is that the Building Committee erred in their selection of English and French artists. Did they? The simple answer is "No," in fact, they did not err: in 1877 and 1878, they had no other choices. While it is true that by this time, La Farge had achieved an excellent reputation as an artist, he was just beginning to branch out into the decorative arts. Trinity was his first major mural commission, and although he had begun experimenting with stained glass in 1876, by 1878, he considered all his efforts in the medium failures. His window clients (namely, Harvard University) were inclined to agree. 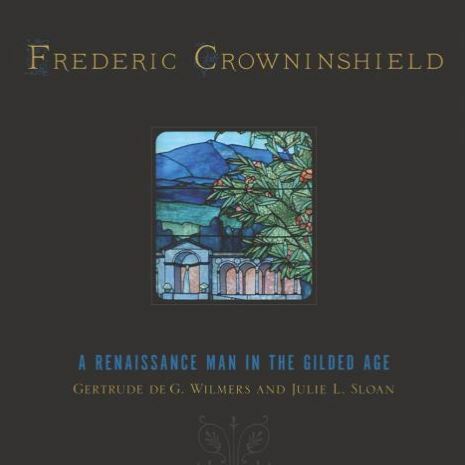 They had commissioned a window from him ("The Chevalier Bayard") which was unsuccessful artistically (from La Farge's point of view) and financially, costing twice as much as the Class wished. They ended up by giving that commission and the next to Henry Holiday. It wasn't until 1880 that La Farge felt confident with the medium, having developed opalescent glass in 1879, secured its production, and located craftspeople capable of interpreting his designs as he envisioned them. 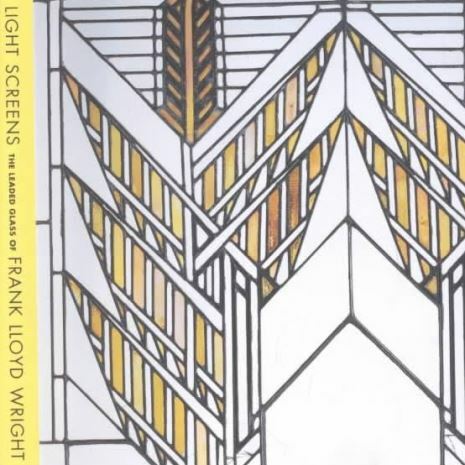 In 1877 and 1878, it was impossible to foresee that he would develop a new glass and revolutionize the design of stained glass windows; from the Building Committee's point of view, La Farge was not an option to design windows until 1880. So why didn't the Building Committee commission a window from La Farge until 1883? Probably because La Farge was too busy with the decoration of the Vanderbilt Houses in New York to accept such a major commission. Instead, in the first years of the decade of the 1880s, the Building Committee turned to Morris & Company, a firm La Farge had visited in 1873. Ironically, it was as a result of this visit, during which La Farge decided that Burne-Jones and the English artists had "reached the end of their rope" artistically, that convinced him to begin to explore the medium. Clayton & Bell, Burlison & Grylls, Henry Holiday, and the Morris Company were some of the best stained glass designers in England. It is logical at this time that an American Episcopal church would turn to English artists, trained to satisfy the needs of the Anglican church. In so doing, Trinity's Building Committee and donors, directed by Brooks, purchased the finest stained glass windows then available. Of all the foreign windows in Trinity Church, the Oudinot windows are perhaps the most unusual, particularly in a New England Episcopal church. French stained glass artists were typically considered appropriate for Catholic churches, not Episcopalian. Typically, American commissions from French studios are found south and west of Philadelphia. Norton, et al., assume that the selection of the Parisian firm was based on the fact that the patrons, the Ritchie family, lived in Paris at the time. This is a reasonable assumption. In sum, although national pride and modern aesthetic judgements might lead us to prefer the La Farge windows today, in determining an appropriate course of restoration, we do not recommend that this partiality inform the decision-making process. 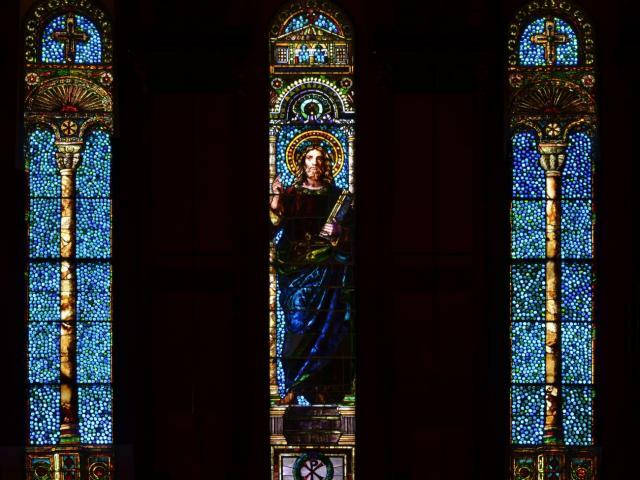 Contextually speaking, from a late-nineteenth and early-twentieth century point of view, all of the windows of Trinity Church are artistically significant. All represent the best work of their type, and all deserve the same high level of care and restoration. A condition analysis of stained glass windows consists of as much historical fact about them as can be discovered as well as a meticulous examination and a report similar to the one that follows. 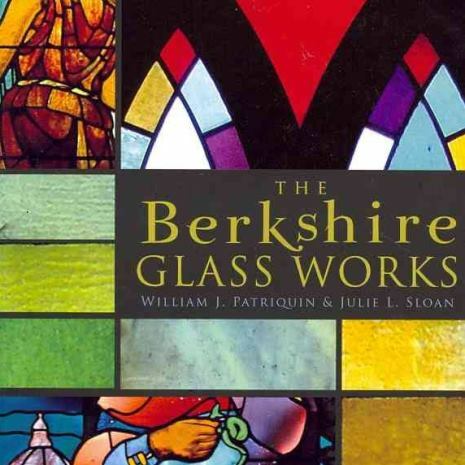 Recommendations for restoration are given in addition to general information about stained glass windows, an explanation of how they are made, an overview of accepted practices in their restoration, and a background of condition analysis. An estimate of the restoration cost - if any is needed - is included in the report. The following analysis of one of the 33 stained glass windows in Trinity Church, Boston, gives a sense of the necessary thoroughness of such a report. The following is from the 1990 report: "Christ in Majesty" (also called "Christ Blessing" in the church handbook, "Trinity Church: The Story of an Episcopal Parish in the City of Boston," 1978), a three-lancet window (a lancet is the vertical division of a window), is located in the west clerestory. 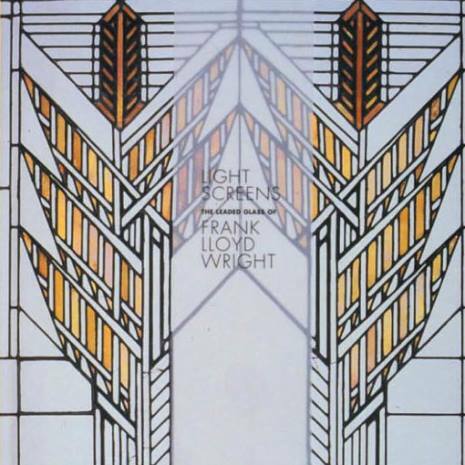 It was installed on March 26, 1883, the first of La Farge's windows for Trinity Church. This window is composed of unusual glass and other materials. 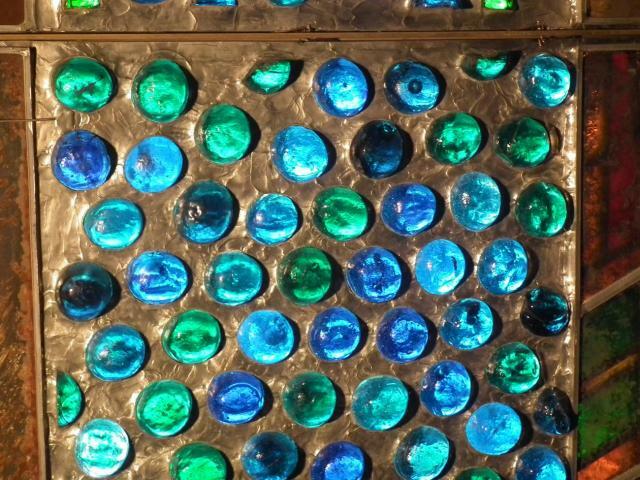 The turquoise blue background, which La Farge referred to as "broken-jewel work," is composed of half-spheres of turquoise, blue, and teal-green, about 2" in diameter, with grass-green fractured glass nuggets between them. Each piece of glass is wrapped in lead came and solder is melted to weld the pieces together and fill in the space between. There appears to be no plating in the background areas, although individual jewels may be plated. The columns in the two flanking lancets and on each side of the center lancet are made of sliced onyx or alabaster and glass. They are plated on the exterior with glass. An early, if not original, unusual detail in this construction is copper wire which spans the column, soldered to the lead came. These wires occur several times in a panel. 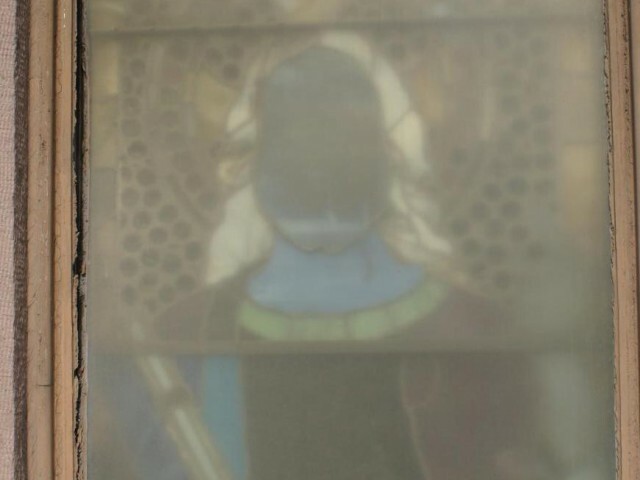 The figure of Christ is composed of several layers of glass (it is impossible to determine the number of layers until the window is removed and dismantled). 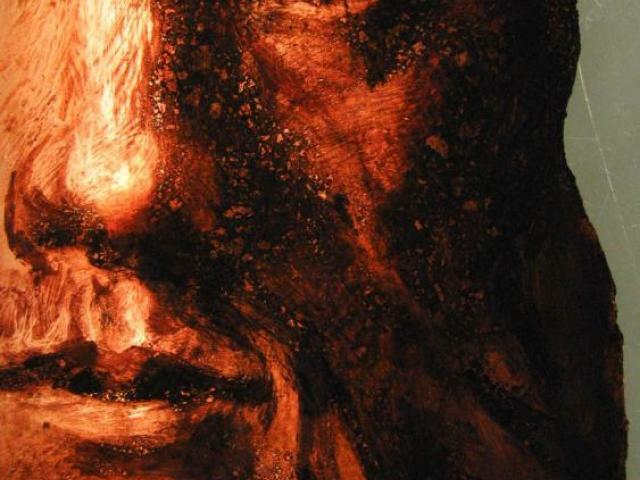 The figure is heavily painted in both flesh and drapery areas. This paint may be fired and cold. The architectural details (the bases, column capitals, and heads) in all three lancets are composed of complex leaded glass and jewels in several layers. As in the figure, there is extensive painting. The window is set into wooden sash. The panels are set individually on T-bars. Each panel has one saddle bar on the exterior only. There are no saddle bars on the interior. On the exterior, this window has been covered with protective glazing. The glazing covering the center panels of the center lancet appears to be of a different age and possibly a different material, having turned yellow and milky. The condition of this window varies in each lancet and is directly related to the amount of previous repair done over the course of the century since the window's installation. This window is unusual in its construction in that the background glass is supported more by solder than by lead. As a result, this window appears to be more structurally stable than other La Farge windows. However, where there is leading, such as in the figure and the architectural details, the lead is beginning to show signs of fatigue. The left lancet appears to have suffered the most extensive repairs. The most recent of these was when the building settled and cracked up the right side of the lancet, separating at the window sill and the jamb. However, there is also evidence that the lancet was repaired at least once prior to this but after installation. The more recent repairs involve extensive use of silicone. Black silicone has been used to seal the edge of several panels at the jamb. Clear silicone is smeared over the onyx in the second panel from the bottom. Removal of this silicone is necessary and may be problematic. It is not known why the clear silicone was necessary. Presumably the piece of stone is fragile, although no cracks were visible. Other cracks in the onyx and glass of the column have been repaired with strap leads. These are, in effect, band-aids of lead covering a crack. They are soldered at each end and may be stuck to the glass with silicone or putty. These may be from an earlier repair campaign. They are used in this lancet much more extensively than in the right lancet. The most seriously deleterious effect of repair found in this lancet was caused by the releading of the bottom panel and the top three panels. These contain the architectural detail but little of the jewelled background. In releading, these areas have been over-cleaned, probably causing the loss of extensive cold paint. 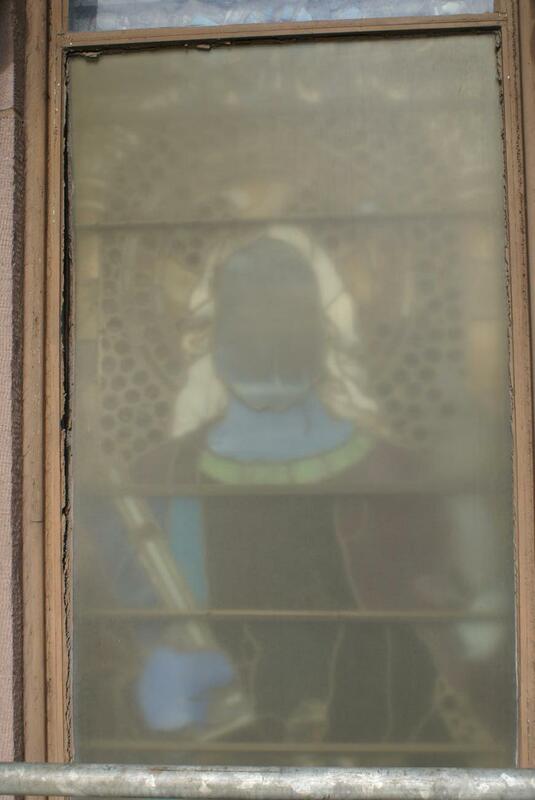 Most critical, at least one layer of La Farge's original glass has been removed and replaced with clear glass clumsily painted with heavy dark paint to simulate the glass details lost. Comparing these areas to those in the right lancet will hint at the extent of glass lost, although some glass may also have been removed in the right lancet. The result is that the architectural details of this lancet are significantly brighter in tone than those in the other two lancets. The artistic and technical integrity of this lancet has been severely comprised by this action. One puzzling aspect of this lancet which may be answered during restoration is that the painting of the column capital is very different from that in the right lancet. It is not modern, however. The right lancet does not appear to have been removed as recently as the left. Although it does have black silicone around the perimeter of some panels, the strap leads appear to be older than those in the left side and there is no releading or clear silicone on the glass. The most perplexing issue in the right lancet is that it appears that the three panels forming the shaft of the column have been rearranged. From the interior, several factors support this. The most noticeable is the color shift in the backgrounds of these three panels and the two which contain the column base and capital. The top panel containing the capital is predominantly deeper blue than the one below it. The third or center panel of the column is deeper in tone than either of the panels next to it, but not as dark as the capital panel. The bottom panel is of similar tone to the center panel, and the second panel from the column base is of similar tone to the fourth panel. In other words, from the top the panels are dark, light, medium, light, medium. The light tone is the same as the overall tone of the left lancet. The panels with a darker appearance have a different distribution of jewels, a greater number of dark blue halfspheres, almost no light half-spheres, and fewer grass-green fractured nuggets. In addition to this color shift, the shaft of the column is not aligned properly. The second panel from the bottom does not line up with either of its neighboring panels. The fourth panel does not line up with capital panel. From the exterior, this rearrangement is even more noticeable. The first, third and fifth panels have been at least re-tinned (floated or coated with solder) if not fully releaded. These are the panels which are darker in tone. 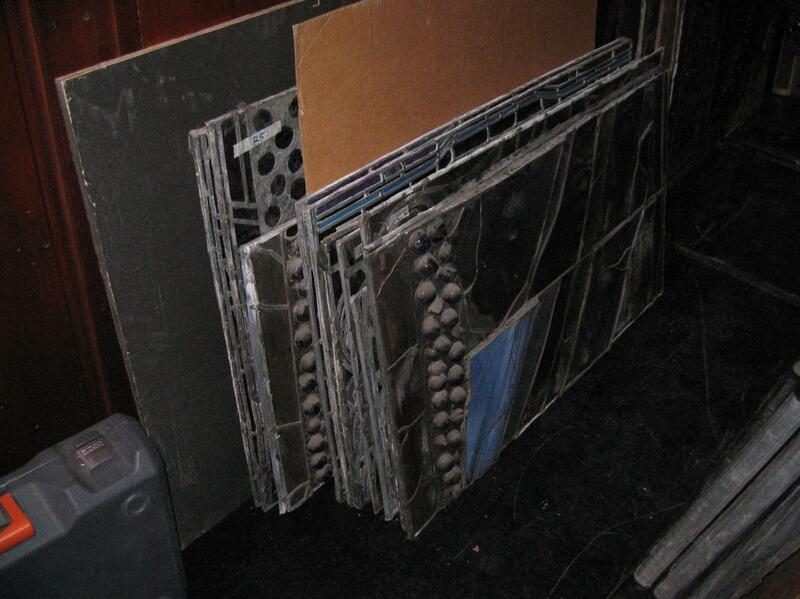 Although on the interior, these panels do not appear to be releaded, this is difficult to determine in the dim light of the church and with flashlights. By cutting up a photocopy of a photograph of the window, the panels can be realigned using the borders as the straight line. Numbering from the column capital to the base, the arrangement which allows for correct alignment is 1, 4, 2, 3, 5. It is possible that the panels themselves are numbered. This was not an uncommon practice among glaziers when installing windows such as this which may become confused. The exact history and whether the backgrounds of panels 1, 3, and 5 were releaded cannot be determined until removal. The architectural detail at the top of the right lancet is much darker than that in the left lancet. In addition to having more original glass than the left lancet (but not necessarily all the original glass), there is probably a great deal of dirt between the plates of glass. Of the three lancets, the center appears to be the most intact and unrepaired. There is one piece of glass, at the figure's knee, which may not be original. In reflected light, it is a light blue, as compared to the dark blue of the rest of the drapery. However, in transmitted light, this color reads the same as the rest of the drapery. The red, green and blue drapery is very dark and almost indistinguishable. This is probably due to the accumulation of dirt between the layers of glass. This is also true for the architectural ornament at the top of the lancet and the flesh areas. This is a very common problem with plated windows. It can be seen very clearly in the lower border of the bottom panel, to the left and right of the wreath where there are mounds of dirt which cast shadows. 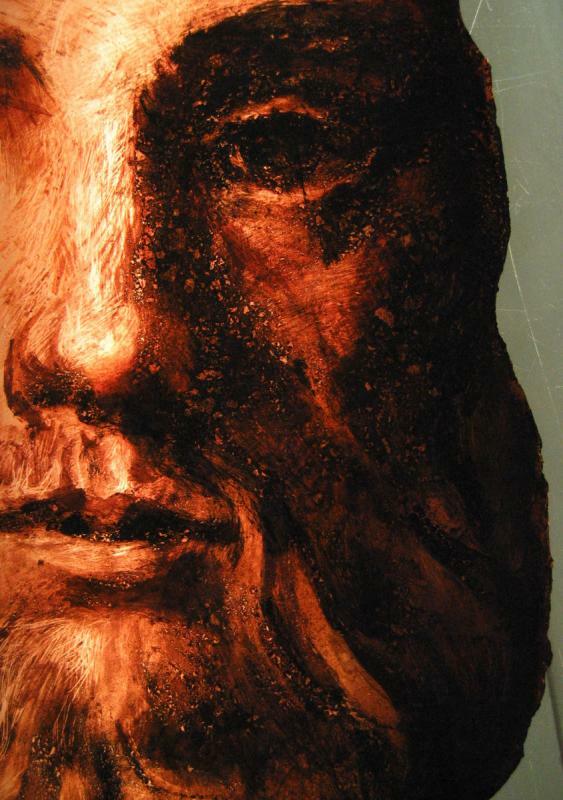 The only paint deterioration which is noticeable at this time is in Christ's left hand, in which he holds a book. The third finger has a very pronounced lighter streak through it, as though the paint had somehow been scraped off. Because the detail in the drapery is not visible, it is not possible to determine whether there is any paint in that area and what its condition is. Once the condition of each window has been determined, anything that is contributing (or could in future contribute) to the failure of its support structure, loss of glass or paint, or damage to its glass and metal matrix must be addressed. Recommendations are made that will preserve the window's structure as well as its artistic integrity for generations to come. If restoration is necessary - and often it is not - the work that is undertaken and completed should endure for at least 100 years, if not longer. Accepted restoration practices include those set forth by those agencies involved with historic preservation and heritage conservation. 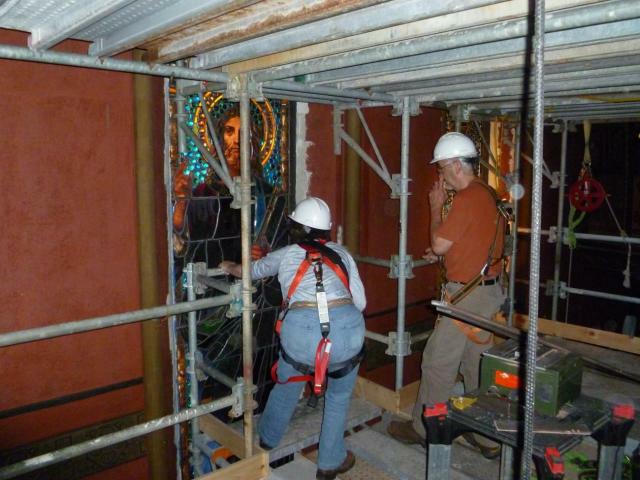 WINDOW 1, "Christ in Majesty" or "Christ Blessing"
Removal and reinstallation of this window will be major project due to its weight and awkward location. Restoration would probably require eighteen months. Restoration should involve the replacement of all lead came except that in the areas of background. At this time, the background leading and solder appears to be sound, but this should verified by closer inspection upon removal of the window. New lead came should be of an alloy proven to withstand the fatigue commonly found in pure lead came. Releading will allow cleaning of the window. This must be done carefully using solvents to prevent the loss of any paint. All breaks in glass should be edge-glued with epoxy or silicone. The silicone which is smeared on the surface of the glass and onyx must be removed. This will probably require use of solvents to remove the glue from cracks and crevices in the onyx, although it may be possible to remove the majority of it mechanically. The onyx may be fragile. Research may be required into the rejoining and possible consolidation of cracked pieces of onyx. The most difficult problem will be the recreation of the missing glass areas. It is very likely that when all three lancets are cleaned, the left lancet will be significantly brighter than the other two, because the amount of glass it has lost. Research into archival photographs of the window may be necessary. However, it may notbe possible to determine what the missing glass looked like. The exterior protection glass should be updated to improve the appearance of the center lancet. In addition, ventilation should be provided. Because of the artistic merit and significance of this window, an isothermal glazing system should be considered. This would involve installing the protective glass in the frame where the stained glass is presently located. A new frame for the stained glass would be constructed within the reveal of the existing frame which would allow the window to be completely inside the building, surrounded by interior air. To all appearances, the window would not look any different except on close inspection of the frame. Design of such a frame may require the input of a structural engineer.